Michael Mastrangelo, MD, FACS, leads an expert team of medical providers who perform inpatient and outpatient surgery at St. Charles Hospital, Bend Surgery Center and Bend Surgical Associates. Bend Surgical Associates collaborates closely with area physicians and specialists to offer the most advanced surgical techniques and procedures for the diagnosis and treatment of disorders and conditions. The surgical team specializes in advanced minimally-invasive procedures which allow for small incisions where patients experience less pain, shorter recovery and better cosmetic results as compared to open surgery. Board certified in general surgery with advanced fellowship training in minimally-invasive Laparoscopy and Surgical Endoscopy, Dr. Mastrangelo is considered the region's expert for Pancreaticobiliary Surgery and Endoscopic Retrograde Cholangio-Pancreatography (ERCP). The team specializes in Endoscopy, Laparoscopy and Robotic Surgery. 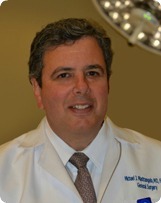 Dr. Mastrangelo has selected a highly qualified staff of professionals to assist him. His team of physician assistants, Dan Cosgro, PA-C and Lisa Turner, PA-C, offer surgical support and follow up care with a personalized approach to patients' individual needs. The clinical coordinator, Lindsi Beard, RN, is the team leader for outpatient care. Whitney Kirkpatrick is the medical assistant and a vital link between our patients and the providers.